In the BRN newsletter, we tell the stories of local businesses that employ people with disabilities, the accommodations they provide, and the contributions those employees make. Read about our most recent featured businesses here. Five Star Call Centers first started employing people with disabilities in 1986. They found call center positions were often a perfect fit for people with disabilities. They have had hundreds of team members with a variety of disabilities who have found great careers at Five Star because mobility, strength and physical stamina are not required for their positions. Currently Five Star Call Centers has 300 employees in Sioux Falls and 550 nationwide. In addition, they hire over 300 agents for the fourth quarter holiday season in Sioux Falls and 700 nationwide. There are approximately 25 employees with disabilities in Sioux Falls and 45 nationwide. There are team members with Amyotrophic Lateral Sclerosis (ALS), Multiple Sclerosis (MS), Parkinson's Disease and Epilepsy that cause limited mobility resulting in the use of wheelchairs, walkers and canes. They also have team members with diminished strength and vision loss. Employees with disabilities work in order entry, customer service, technical support and sales positions. Accommodations provided include flexible work schedules, frequent breaks, customized training, special equipment including ergonomic work stations, larger monitors and special computer software for those with vision loss. Their Sioux Falls facility is all on one level with a large entry and private restrooms. Joel Sylvester, Chief Marketing Officer, states, "We find team members with disabilities have amazing personalities, spirit and passion who love to do their job every day and help customers over the phone. Problem solving is a part of their everyday life and translates into being a great team member." Five Star has worked with state agencies such as Vocational Rehabilitation and Service to the Blind and Visually Impaired as well as Community Campus to find employees. Five Star Call Centers HR Generalist, Danielle Sickinger, is responsible for pre-screening all applicants. Specific hiring decisions are made by Custom Success Managers whose roles range from general customer service to technical support and medical and financial services, so team members can be placed in the best position to succeed based on their skills and experience. "Employing people with disabilities has always been a part of our company culture, from the beginning over eight years ago," states Melissa Johnson, CEO at Oh My Cupcakes! They employ 28-30 people depending on the season, and three or four employees have disabilities. Melissa and Amanda Feldkamp, Director of Operations, are responsible for hiring employees. They look for both a schedule fit and a culture fit. One employee has a short-term memory problem as a result of a traumatic brain injury, while others have language barriers, mobility issues and mild learning disabilities. "People with disabilities are great for the jobs that everyone is willing to do, but some of the more skilled ninjas (like our kitchen manager, for instance) may not have time to do. These include our never-ending dishes, sweeping, folding boxes, putting stickers on containers, etc." says Melissa. When their team member with short-term memory issues started, they made a diagram of the kitchen with reminders of where each dish/piece of equipment gets put away as an accommodation. Another accommodation includes providing extra instruction to employees when needed. Over the years, Oh My Cupcakes! has worked with Lutheran Social Services, LifeScape and the Sioux Falls School District to fill open positions. "The coaching they provide is crucial and so appreciated as an employer," states Melissa. When asked what the benefits are of employing people with disabilities, Melissa says, "In addition to being a vital part of all that we need to get done in the course of a day, the smiles and warm attitudes are one of the greatest benefits!" Oh My Cupcakes! is always on the lookout for great people! There is an application on their website that can be printed, filled out, and brought in or mailed in. If you have specific questions, please reach out to them for assistance. 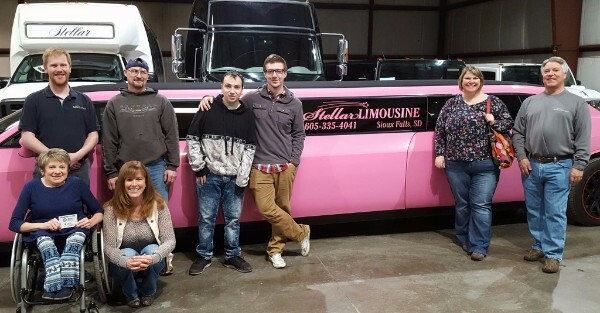 Tom and Ann Olson started Stellar Limousine in April of 2008. They currently have 25 employees. One employee has an intellectual disability and another employee has a Traumatic Brain Injury (TBI). The employees with disabilities perform warehouse and office duties including vacuuming the red carpets, filling bags with ice and putting them into the freezer, and cleaning the bathroom, rims of tires, cab areas, and outside in front of the building. Some of the workplace accommodations Stellar Limousine has provided to their employees include being flexible in their their work schedules, allowing breaks when needed without having to ask permission and working off of visual charts. In 2010, a job developer with South Dakota Achieve, now known as LifeScape, came to Tom and Ann's door asking if they would consider hiring someone with a disability. They said yes! Both of their current employees with disabilities work with LifeScape. When Ann was asked what she sees as the benefits of hiring people with disabilities, she states, "Their willingness to help, the pride they take in their work and having the opportunity to help them learn a vocation." Thank you Stellar Limousine for employing people with disabilities! Fareway Food Store on 41st Street has four employees with disabilities. They work closely with LifeScape and the Sioux Falls School District Community Campus Program to place people with disabilities in their store. Fareway has an environment of inclusion where they recognize every employee has their own set of strengths and weaknesses. Of the current four employees with disabilities, three regularly bag groceries, provide carryout customer service, and assist with stocking and facing shelves. The fourth employee provides prep and works in the produce section. Fareway takes pride in providing personalized one-on-one training, both for the management team and their employees. The store management team works with each individual to help them recognize strengths and opportunities to succeed. Grocery Manager Aaron Rice is particularly proud of the team collaboration and works to always foster a positive, fun working environment. Duties and responsibilities that are necessary in their working environment are filled with individuals with disabilities. In the Fareway family, all members are treated equally. The Good Samaritan Society National Campus has approximately 750 employees. Five employees have disabilities and hold positions in finance, information services technology, print shop and human resources. Doug Williamson is the Manager of Employee Relations at the Good Samaritan Society National Campus and has been in his position for 8 years. When asked what the benefits of employing people with disabilities are, Doug states, "It puts people into the workforce where they want to be." The Good Samaritan Society National Campus has provided reasonable accommodations to some of their employees with disabilities. They include: adjustable office furniture such as sit to stand desks, step stools, and ergonomic keyboards. Employees work with their managers when there is a need for more flexible scheduling. The Environmental Risk Manager conducts an ergonomic assessment during employee orientation in case any accommodations need to be made. Almost all of the doors at the Good Samaritan Society National Campus have automatic door openers. Some employees brought up the need to have an Americans with Disabilities Act assessment completed to ensure everything was in compliance throughout the campus. Business Resource Network connected them with Independent Living Choices to conduct the assessment. Minor changes such as making more room between the tables in the dining hall, moving the silverware to a more accessible spot and having the hot soups served by staff rather than having employees handle it themselves were made. Theresa Flannery is the co-owner and catering director at Ode to Food & Drinks and has been there since it opened on 4/1/2015. She is also responsible for hiring employees. They have 25-30 employees. Four of those employees have disabilities that include deafness and intellectual disabilities. Employees with disabilities have dishwashing and food preparation positions and have been employed since the restaurant opened. Staff with LifeScape and Minnehaha County Human Services introduced some of the employees with disabilities to Theresa and assisted with on-the-job training. When asked what the benefits of employing people with disabilities are, Theresa states, “They are pleasant to work around! They remind us to slow down and be more appreciative. They love their jobs and they are hard workers. They quickly become part of the Ode family." Ode to Food & Drinks has provided reasonable accommodations to some of their employees with disabilities. They include: flexible work schedules, frequent breaks, written instructions, photo instructions and a white board for immediate communication. Ode to Food & Drinks currently has some possible part-time positions to fill. If someone is interested, they can stop in and pick up an application at 300 N. Cherapa Place in Sioux Falls. If a person needs assistance filling out an application, it is best to stop in between 2 pm-4 pm.